If you find you have to deal with Immigration and Customs Enforcement (ICE) or other law enforcement officers at home, on the street, or anywhere else, remember that you have the rights described in this factsheet. 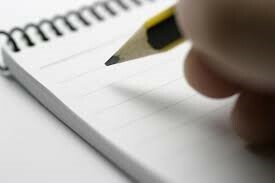 The factsheet also provides suggestions for what you should do to assert your rights. 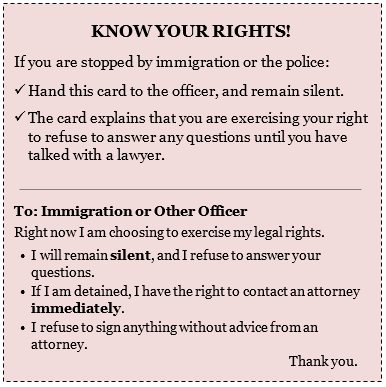 Carry a know-your-rights card and show it if an immigration officer stops you. The card explains that you will remain silent and that you wish to speak with an attorney. To be allowed to enter your home, ICE must have a warrant signed by a judge. Do not open your door unless an ICE agent shows you a warrant. (They almost never have one.) If an ICE agent wants to show you a warrant, they can hold it against a window or slide it under the door. To be valid, the warrant must have your correct name and address on it. You do not need to open the door to talk with an ICE agent. Once you open the door, it is much harder to refuse to answer questions. Before you sign anything, talk to a lawyer. ICE may try to get you to sign away your right to see a lawyer or a judge. Be sure you understand what a document actually says before you sign it. If you are worried ICE will arrest you, let the officer know if you have children. Make sure your loved ones know how to find you if you are detained by ICE. They can use ICE’s online detainee locator to find an adult who is in immigration custody. Or they can call the local ICE office. Make sure they have your alien registration number written down, if you have one. You can call the Executive Office for Immigration Review (EOIR) hotline number at 240-314-1500 or 1-800-898-7180 (toll-free) 24 hours a day, 7 days a week to get information on your case’s status. If it is possible and safe for you to do so, take photos and videos of the raid or arrest. Also take notes on what happened. Call United We Dream’s hotline to report a raid: 1-844-363-1423. Send text messages to 877877.